The cartoony noir classic Roger Rabbit is ready for a sequel — but how are they going to transition it to the 21st century? Will it be set in modern times? Will animated characters get replaced by CG Pixar creatures? 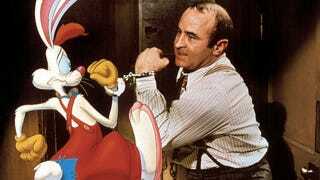 Does anyone actually want a sequel to Who Framed Roger Rabbit? It would be done just like the first one. It would look the same way, but we would present it in 3-D in its release. I would do all of the animation hand-drawn; 2-D, but using 3-D tools. It wouldn't be like Pixar 3-D. It wouldn't look like that… this would again be another period movie. Also according to the interview, the script is dunzo and sitting on the desk at Disney (and it was penned by the original writers). All he needs now is Disney's okay, and he's ready to go forward with it. We always loved the mystery movie bookended by zany toons and murder. Here's hoping they can keep that same feel without Bob Hoskins (now that he's sadly retired). The plan is to re-release the original film in 2013 with a Blu-Ray, and then film the sequel in 3D.